Five years after hemp prohibition began, the United States government urged patriotic American farmers to grow hemp to support the war effort. 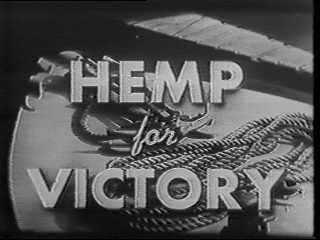 In 1942, the US Department of Agriculture released the film, "Hemp For Victory." This 14 min. 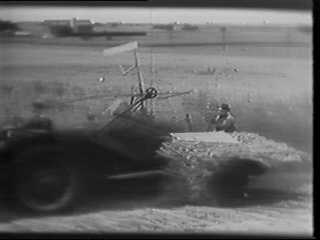 propaganda film was part of the campaign to get farmers to grow hemp. 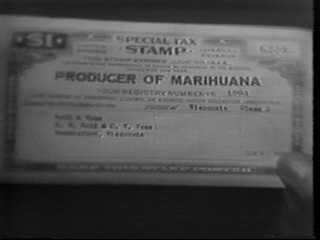 For $1.00 a farmer could purchase Marijuana Tax Stamp that allowed them to obtain seeds and cultivate the crop. The film gives a brief look into the cultivation, harvesting, and processing of hemp into marketable goods. After the war, the plant that had been grown for victory, again became the prohibited bountiful weed of the earth. There has been no time like our present moment in history that necessitates such a radical suspension of law at the state and federal level to allow and encourage the domestic cultivation and manufacturing of hemp and hempen goods. The non psychoactive strains of cannabis sativa, generally referred to as hemp, have been utilized by humankind for over 10,000 years. The last 3,000 of which, it was the largest agricultural crop in the world. Undoubtedly the planets premier annually renewable resource, hemp can be used as the raw material for products that are currently produced out of cotton, petroleum, timber, and soybeans. Unlike it's market competitors, hemp can be cultivated, manufactured, and consumed with a fraction of the chemicals or pollutants that are used in the processing or utilization of cotton, petroleum, and timber products. And the hempseed provides a protein source that is superior to soybean by providing every single Essential Amino Acid and Essential Fatty Acid that the human body needs but cannot produce. Though hemp is a strain of cannabis sativa, it is not marijuana. Conversely, marijuana is not hemp, even though it too is a strain of cannabis sativa. The terms are more like brand names for different parts of different strains of the cannabis plant. Their true difference lies in the cannabiniod makeup, in particular delta-9-tetrahydrocannibinol (THC) and cannabidiol (CBD). THC, the psychoactive cannabiniod found in marijuana, binds with specific receptor sites to produce an experience of euphoria, what is often referred to as a high. CBD, which binds with the same receptor sites, is not psychoactive and causes a headache, effectively blocking the THC and preventing it from binding with the site. Generally a hemp plant contains less that 1% THC and has a high CBD to THC ratio. The marijuana plant on the other hand contains anywhere from 5% to 20%+ THC and has an extremely low CBD to THC ratio. It is because of this ratio that hemp is non psychoactive, the more hemp one would consume to experience a high the greater the headache they would give themselves. Additionally the are noticeable phenotypic differences and cultivation methods, making it easy to visually differentiate the two strains of cannabis sativa. It wasn't until 1937 that the strange notion of hemp prohibition came into public consciousness and law. A few years prior to this time, the hemp industry began a decline due to a lack of modern processing machinery. It was this decline that opened the door for the cotton, timber, and petroleum industries to flourish. Around 1937, modern hemp processing machinery was making its way over to the United States from Germany. The newly invented decorticator finally brought hemp into the industrial age. For the first time in human history, hemp, which had traditionally been laboriously harvested by slaves, could be processed by the ton at a cost of mere pennies. Fearing the lose of business, the timber and petroleum companies lobbied Congress to pass the "Marihuana Tax Stamp Act." This law required any person who manufactured marihuana (which was defined as the leaves and flowers of the cannabis plant) to pay a tax for a stamp to legally cultivate the plant. Since the beneficial hemp stalk needs leaves to grow, the farmers were also required to pay the tax for the stamp. In 1938, Popular Mechanics magazine ran an article declaring hemp to be the "new billion dollar crop," but by then it was all but too late. Five years after the passage of the tax act, the Department of Agriculture released a film entitled "Hemp for Victory." 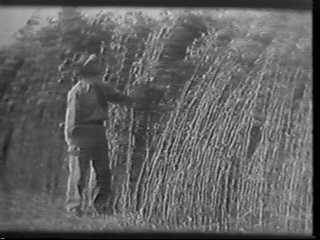 This 14 minute propaganda film urged patriotic farmers to grow hemp for the war effort since United States hemp supplies from Asia had been cut off. When the war ended so did the "Hemp for Victory" campaign. After a rebirth in the late 1960's, hemp is slowly regaining the world wide economic foothold that it once held. Currently the United States is the only industrialized nation in the world that continues a prohibition on the domestic cultivation of non psychoactive cannabis sativa, though materials not classified as marijuana (mature stalks, roots, seeds incapable of germination, and hemp products) may be imported. In the United States alone, the not yet mainstream hemp industry accounts for over a $150 million dollar a year market. If fully realized, a global hemp market could potentially be a trillion dollar a year industry. send the wrong message to the children in a time when youth marijuana use is on the rise. Not one of these arguments against the lifting of the unconstitutional Federal prohibition of hemp is based upon fact, but rather based in fear and public apathy, ignorance, and compliance. At the sate and local level, hemp reform is sweeping the nation. States are passing hemp research bills, if not full legal cultivation. Additionally we are seeing a greater number of hemp based products in mainstream markets. However, at the Federal level it is a different tale. In a sweeping death blow to the emerging hempseed food and cosmetic industries, the DEA has filed to redefine marijuana to include any part of the plant with any detectable trace of THC. This would effectively make all products derived from cannabis illegal under Federal law. There are exemptions for products not intended for human consumption or cosmetic application. This backlash against the hemp industry began when Janet Reno stated that the DEA lacked the jurisdiction to stop the importation of sterilized hempseed (which has been legal throughout cannabis prohibition) unless they redefined the legal definition of marijuana. Additionally, there are reports that the consumption of large amounts of unwashed hempseed can produce a false positive on a drug test. Though these reports have been unsubstantiated, the ONDCP has used them to pushed for the changes to ensure and protect the drug testing programs. As we enter the new millennium, this ancient plant is once again taking its rightful place in the world. Hemp prohibition could end today, if only enough people stood up and declared it that way.
! Hemp for Victory ! Hemp for Security ! Hemp for Independence ! without the permission, or risk prosecution under Federal Law. This web site is published by Hemp Advocates for the benefit of earth..